Seafood Paradise 3 game play fish hunting game board is available for redemption cabinet, that support 4, 6, 8 and 10 players at any one time. 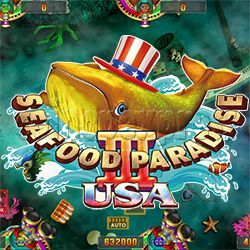 Seafood Paradise 3 game comes with various new game features and new special weapons. These weapons randomly float into the field. Attack them to release their special powers. - Magical Firework Rocket: The Witch will summon the fish guards at any time. Attack the Witch will detonate the Firework Rocket, killing all ordinary fish on the screen. - Freezing Canon: Shoot a huge frozen flame and freeze fish swimming around. The frozen fish has a great chance of death. - Thunder Hammers: Fire three charged hammers at random locations. This attack damages all fish within a small range. - Miracle Fairy: Miracle Fairies catch fish swimming around the play field. More Miracle Fairies are needed to catch the larger fish. - Breaker Thom Ball: Attack blowfish while shining will cause a thorn ball blast. - Fish King: Killing the Fish King also kill all same kind of fishes in the field. - Lucky Fish: When a player kills the Luck Fish the will get a bonus reward for killing any kind of other fish.